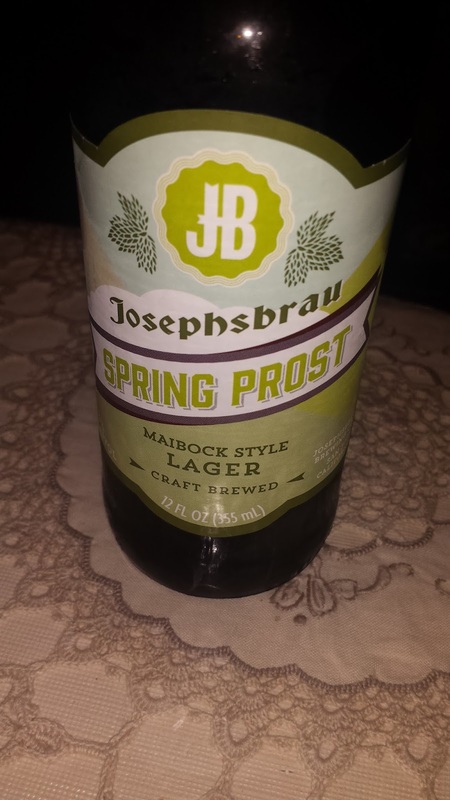 This week's Sunday Night Suds looks at Joseph's Brau Spring Prost. This beer is another in the long line of Trader Joe's brews produced under license by the Gordon Biersch company (which also contract brews for Kirkland, among others). The Spring Prost is Maibock style lager, which as explained by the good folks at BA, is a style which "tends to be lighter in color than other Bock beers and often has a significant hop character with a noticeable alcohol around the same as a traditional Bock. Maibocks are customarily served in the spring and are oftentimes interrelated with spring festivals and celebrations more often in the month of May." The Spring Prost is 7.3% abv, but I could not taste any alcohol flavor, which is usually characteristic of beers above 7% abv. Instead, the beer tasted like a light bock, almost like someone had taken a Shiner Bock and just turned it into a light beer. This is not to say that it was light on taste, just like the bock aspect was muted. I could see having this with fish or salads, but it would not stand up to grilled chicken or stews. Joseph's Brau Spring Prost is under the Kosher Supervision of the Va'ad of Detroit and there is a kosher symbol on the back label on the bottle. Keep in mind, not every Trader Joe's/Joseph's Brau beer is under kosher supervision, so check bottles for kosher certification service mark from the Va'ad of Detroit.